2006 was not the best year for games. Although our excitement was almost unbearable at the prospect of a new PS3 or Wii, there seemed to be fewer quality titles worth buying throughout 2006. With all of the consoles transitioning to their next-gen (now current-gen) systems, this is natural as the industry refocuses. Still, if you buy or play less than 10 games per year, there were some true gems worth the $50-$60 price tag. A QUICK CONSOLE YEAR-IN-REVIEW: 2006 was a banner year for Nintendo. In one short year, the company managed to win back the goodwill of the gamer community; make the DS the year’s number one system; and release the killer Wii. Sony, on the other hand, seems to have dropped the ball. Although the PS3 is not as bad as the blogosphere would like you to believe, Sony did miscalculate the gaming community's willingness to pay top dollar for a top-dollar system with only one "real" launch title. And then there's Microsoft; with their near-perfect XBOX360, they seemed poised to take the top spot in the epic battle of console titans. 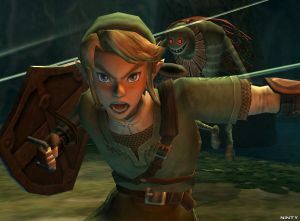 Legend of Zelda: Twilight Princess - If you were lucky enough to get a Wii then LOZ is a must. While boasting amazing graphics and great audio, the real price of admission for me was the wonderful control mechanics made possible only by the Wiimote. Swinging your sword in battle and throwing projectiles are as intuitive as moving around. With a lengthy and compelling story, you don't want to miss this one! New Super Mario Bros. - Returning to it side-scrolling roots, New Super Mario Bros. is a great pick-up-and-play title with crisp graphics, great audio, and the best gameplay of any DS game to date. It's a welcome return to the way we used to play games and is a must-have for anyone who owns a DS. Gears of War - There isn't a better looking game on this list. And while I wouldn't judge a game completely on graphics, it really does push this title over the edge. Complete with amazing gameplay and a simple story, GOW is intense from beginning to end. If your planning on buying an XBOX360 soon, this is really the only sure-thing out there. Resistance: The Fall of Man - This is the only title to buy for your PS3. It's action-packed and well-paced, graphically beautiful, and has some really cool weapons. But what made this game great from my favorite developer was the revisionist story of pre-WWII Europe in the throws of an alien invasion. "Aliens" plus "WII shooters" is apparently the recipe of a great game (and coincidentally, are the secret ingredients to my Mom's famous chocolate-chip cookies). Guitar Hero 2 - Don't cry heresy because I didn't choose Final Fantasy (it was really, really close), but FFXII only lasts 60-80 hours, whereas GH2 could last a lifetime. Guitar 1 or 2 are truly the most fun you'll have on any system! With a cheeky-looking guitar controller and long replay value, GH2 improves on its already successful formula and adds the best new feature of the year, cooperative mode, which allows you and a buddy to play any song together. Add “Sweet Child o' Mine” and “Freebird” to the mix and you have yourself a winner! Daxter - No other portable game blends great gameplay, compelling story, killer graphics, and humor the way Daxter does. From the PS2 series, Jak & Daxter, our little Dax is all fine on his own and is another great installment in this series. Legend of Zelda: Twilight Princess - If you've played it, then this comes as no surprise to you. It's fun, has great level design, and this year, was the best way to spend 50 hours on a couch! 3 people	reviwed this story with an average rating of 3.0.